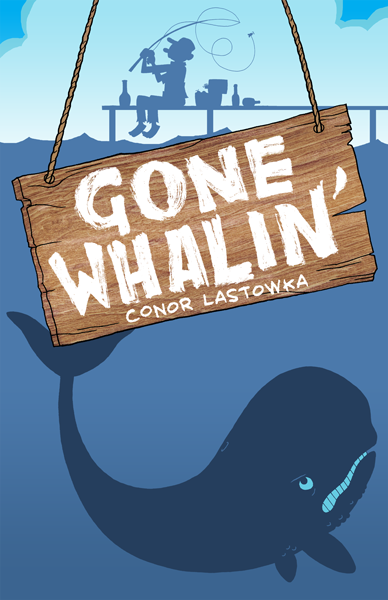 Here's my review of Conor's new novel, Gone Whalin'. 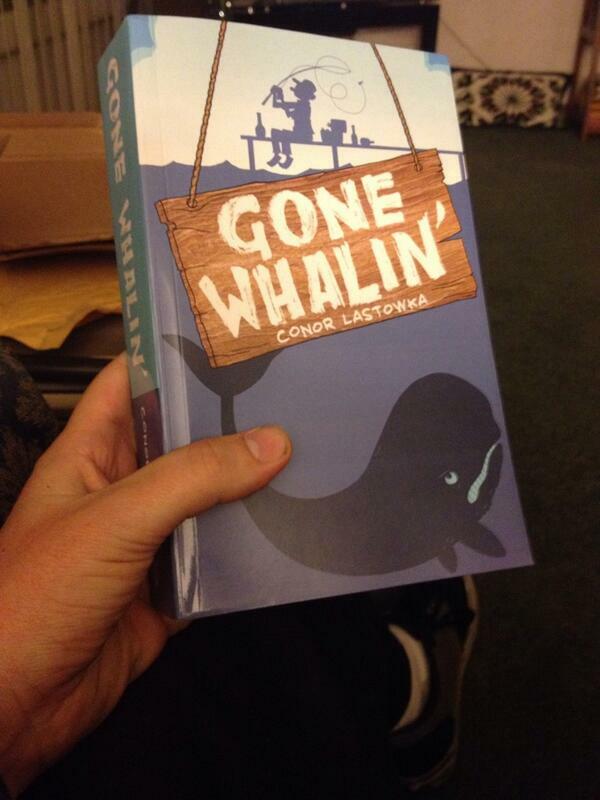 I purchased this novel because I happen to know that it's writer, Conor Lastowka, is a very funny person. How do I know this? Let's say that I am an enthusiast of RiffTrax commentaries. For those of you who don't know, RiffTrax is the online incarnation of Mystery Science Theater 3000, starring the team of the final three seasons, Mike Nelson, Kevin Murphy and Bill Corbett. Now, MST3K, especially in its last three seasons, is incredibly funny. But I have to say that I think RiffTrax is a lot better, and one of the reasons is that they have at least two writers who are writing jokes that my generation (born in the 80s, grew up in the 90s) will appreciate and laugh at. Whenever I hear jokes that reference 8-bit Nintendo games or certain Saturday morning cartoons, I know that they had to have been written by either Lastowka or his writing partner, Sean. So that long, rambling paragraph explains WHY I bought the book. Now, whether or not the book is actually funny and/or entertaining is a totally different thing. Just because somebody can write RiffTrax jokes doesn't necessarily mean that their humor will translate well into prose. I took this into consideration as I started reading the Kindle version yesterday (to get a head start on it while I wait for the paperback version to reach me,) and I gotta say that I forgot about any such consideration before I even finished the first chapter (or day.) Lastowka makes the funniest jokes I have read in prose novels in all of 2013. I don't want to give them all away, but this was the joke that pretty much locked the whole book for me. "How does one measure something like "percentage of mobility loss on your right side" anyways? It sure looked like less than 90 percent every time Cormac saw him wheel by." So yeah. If you're in it for the LOLs, which I definitely am, there are more than enough. It's rare when a book claiming to be a laugh-riot actually turns out to be a laugh-riot. Gone Whalin' actually delivers what it promises. So all aboard and argh, matey! I'm first in line for this and whatever comes after. Thumbs up and so on. Thanks Dodge. I meant to create a post about my book in here but didn't have a chance to last week. But yes! I wrote a novel, and it's funny, and I hope you will read it and that it will make you laugh. It was awesome of SRD to write that amazing review, and Mr Torso already sent me a pic of the book on his Kindle Fire. If you get one, send me a pic or let me know how you're enjoying it! No, I don't know why Citation is showing up twice. I'm pretty sure I didn't buy it twice. Wait, so this ISN'T a fanfic sequel to the 1997 Joe Pesci and Danny Glover movie Gone Fishin' ?! I am disappointed. I was at a whale watching tour that turned out to be not that (the weather wasn't so good, so we just stayed on the boat, which went nowhere, and we ate and drank) and they gave us a city map, a mousepad shaped like a whale chart and a book about Ulsan's whale history called "Yes, Whale", which has become my favourite thing ever for the title alone. Hope you enjoy Gone Whalin'! I didn't realize how much page count would affect a book's cost. I assumed/hoped I'd be able to sell a paperback for under ten bucks, like the [Citation Needed] books. Because it was over 600 pages, the minimum price you could set it at was $14.50, which would net you exactly 0.00 if you sold a copy. Fortunately, Amazon has strange methods of reducing books down from the list price, so this one has already been available for 12, 14 and 13.50, which is where it is now. Well, considering that a lot of first time novelists like to stick a $20 price tag on their 50k-word Nanowrimo novel that has poor formatting and AWFUL graphics (if I may say as a designer), your price is actually quite reasonable. Speaking of covers, who made the cover graphic? It's a pretty good one. I'd liked his illustrations for a long time and was really happy he agreed to do a cover. Cormac Mcllhenney, huh? Is the name a coincidence or can I expect to find some Cormac McCarthy references? Mine should get to me Friday. Looking forward to it. That's cool. I wish more people would realize how important design is to their books. So many people can't be bothered to care what the OUTSIDE of their books look like, let alone the INTERIOR. But this book is very well designed, it means that you give a damn. I guess it's a coincidence, though I was certainly aware of the similarity. McIlhenney is the last name of the folks who run the Alpine Brewery in San Diego, and I always thought it was a cool last name. The main character in the comic strip I drew in college was named Corbin, so I guess I have a thing for leads with COR___ names! Hope you enjoy it when it arrives! Yeah, the book interior was the trickiest, most terrifying part. I have no visual eye whatsoever, so figuring out not only how InDesign works, but what would look good in InDesign, took quite some time. Fortunately, there's a lot of resources that recommend stuff like fonts, and things like margins are laid out on the createspace forums. I found a font that I thought looked good and ran with it. Still had to adjust the margins in the whole thing once I realized it would be over 600 pages. Then there was stuff like Orphans/widows, which are single lines that go on to the next page, which you don't realize never happen in professional books, but they look pretty crappy once you notice them. That was almost entirely a manual process to go through and adjust page margins for them. But I was also lucky enough to have a friend to help with the back cover layout as well as my ex-comic partner to do interior illustrations for each chapter, which I feel add a lot.